New inventory was a concern for dealers in October. 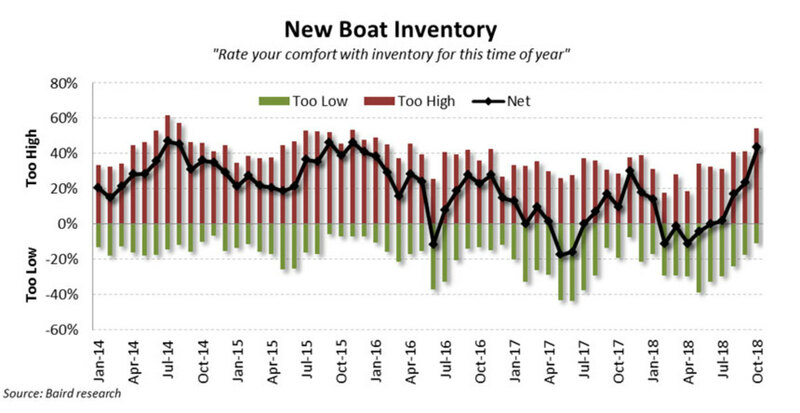 More than half of marine dealers said their boat inventory was too high in October, and only 11 percent said it was too low, according to a new survey measuring market conditions. Several suggested a lack of urgency on the part of consumers after months of strong demand had contributed to the amount of products on showroom floors. They also pointed to lackluster promotions as a reason for dampening momentum. Weather played a part in many pockets of the country as well, being cited as the No. 1 negative impact during the month, followed by government action or inaction. That all contributed to a fairly dramatic drop in dealer sentiment regarding current conditions and longterm outlook. Dealer sentiment on current conditions dipped from 65 in September to 60, its lowest level in many months and a sharp decline from October 2017, when it was 77. The three- to five-year outlook dropped to 59, its lowest level since the survey was launched in 2014. September’s rating was 73, and October 2017 it was 78. For context, 50 is considered a neutral rating. 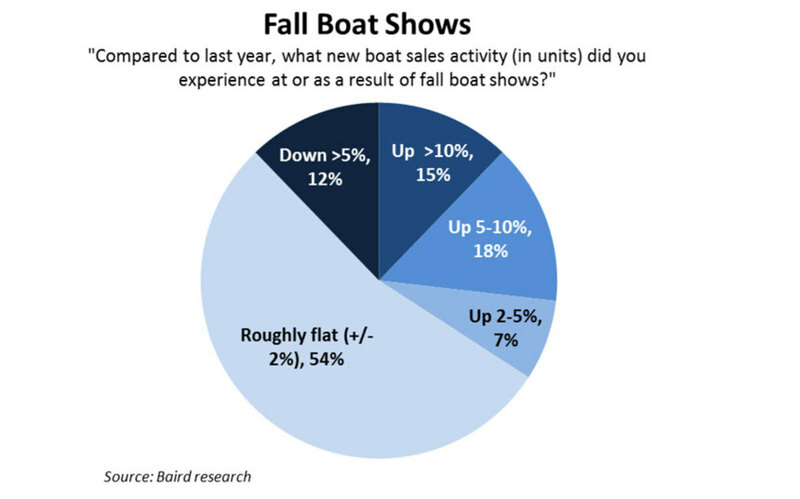 Dealers also gave feedback on fall boat shows, with about half, 54 percent, saying sales were roughly flat with last year’s fall shows; 34 percent reported an increase. Fifteen percent reported gains more than 10 percent, and 18 percent said fall show sales were 5 to 10 percent higher than in 2017 — 12 percent said they were down from last year.